Sean Dyche apologised to his predecessor Eddie Howe after spoiling his 40th birthday. Burnley went sixth in the Premier League, above Spurs, after a 2-1 win against Bournemouth at the Vitality Stadium. Chris Wood and Robbie Brady netted either side of half-time, with Josh King pulling a goal back late on, but Burnley claimed a fourth away win of the season to climb the table. Dyche said: "I joked with him before the game about that (spoiling his birthday), But I didn't actually mean it. "The work he's done here is absolutely amazing. "We're similar in our beliefs in that he wants his players to work hard, and a lot of the old-fashioned values. They're so important, certainly for me. I know he wants to play well, in his style, but to also work hard and give everything. "I said to him before the game, 40 years old and 430-odd games as a manager, that's unbelievable. "Sorry to ruin it for him tonight, but he'll survive!" 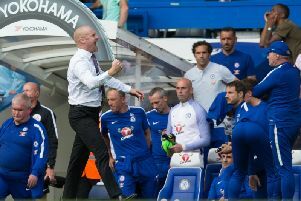 Dyche was delighted with the way his players didn't swell on their injury-time defeat against Arsenal on Sunday: "I believe in the group anyway, but I'm super pleased with that. I think there were a few question marks, people saying 'they've taken a knock, can they bounce back from that? ', which I understand, of course, but I didn't look at it like that. "I was so pleased with the performance against Arsenal, against a top side, and I believe in the players and their professionalism. "We gave them the day off Monday, no worry about it, and they were focused and prepared, particularly in the first half - I thought we were excellent." He added: "A team like us, you've got to see through the knocks you take, because in the Premier League, if you take a bad couple of results, that can lead into three, four, five, and you have to know your group is working in the right manner to get results. "I think we do that well, a lot of challenges come your way in the Premier League, but we're doing a lot of the right things at the right times at the moment. "We know there's plenty of work to be done, but we're doing it in a very good fashion at the moment." Burnley were deserved winners, again displaying an impressive mix of football as they built on the performance against the Gunners: "I was really pleased with all aspects, the pressing, the energy, quality - we've hit the bar, made the keeper work, had a one on one, scored a goal, and defensively Nick Pope's not had a lot to do. "Second half it changed a bit, they threw caution to the wind,but we defended well, as we tend to do, scored a great goal through Robbie Brady, and we were quite calm in our defending. "Even when they scored, there wasn't a frantic edge to us, the two centre forwards going on made a difference, and saw the game out, rightly so."